Microwave popcorn is super-convenient, but those pre-mixed bags can be pricey. What’s more, some varieties of microwave popcorn may contain high fat and salt levels – or perhaps even undesirable food additives. Psst! Here’s a secret. Make ‘em yourself. Toss about 1/2 cup of plain popcorn kernels into the paper sack. Fold the top of the bag shut. Then fold it again to make a nice seal. Do not tape or staple the top. Put the bag in the microwave oven, and set it for “popcorn.” (Well, sure.) If your microwave doesn’t offer that option, set it for 2:30, and be ready to stop it, if the popping finishes sooner. Open the bag carefully, as it will likely emit some steam. Add your desired toppings, such as salt, butter, shredded cheese, or spices. 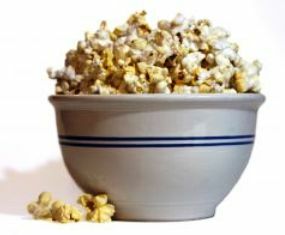 Close the top of the bag, and shake it well before pouring the fresh-popped treat into a big popcorn bowl for serving. Or eat it right out of the bag. Just for fun, why not microwave individual portions of popcorn in separate bags for a family movie night? Wow I had no idea there was a less expensive to enjoy popcorn- thanks for this tip! I never thought of this! Great tip. My wife makes it on the stove. I had no idea you could even do this. Thanks for sharing! very cool!! Thanks for sharing this! Hi Linda Ann! I love your blog and I've nominated you for the Liebster Award! Congrats and good work! You'll read more about it on my blog in the next couple of days. I never thought to do this. We used to have an air popper. This sounds similar.